Pierogi are semicircular dumplings made of unleavened dough, stuffed with a variety of fillings. I've cooked pierogi a couple of times but have never attempted making them from scratch, because honestly, it is a lot of work, and I usually only go for quick and easy recipes. I’ve had a box of pierogi sitting in my freezer for a couple of months now and I finally decided to make a meal of it yesterday. Bring a large pot of salted water to a boil. Add the frozen pierogi and cook for 3-5 minutes. Drain. Melt the butter in a skillet. Add the garlic, chopped onions, savory, red chilli flakes and sauté till onions are translucent. Add the diced red bell pepper and cook till tender. Add the cooked pierogi and mix well into the skillet mixture. I'd like to try making them one day. This is one dish that doesn't seem to have made it to Indian shores yet - at least by this name! Never heard of this. Looks so yummy! I have to try this. Makes for easy meals. I haven't tasted pierogi but looking at the pictures I can say it will be delicious. 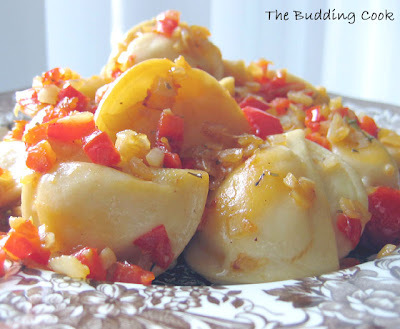 i cant remember the last time i had pierogi... would love to make it from scratch some day! Everytime I walk by the freezer in the grocery store I look at these and almost pick them up but never do... :) This sounds like a perfect way to make them and I'm sure to get a box soon and give this a shot. must be tasting good when served hot , right ? Lovely Pierogi! Been ages since i had some!! Looks amazing! These look so good! Must try to make them one day. The pierogis look delicious, tbc. Lovely pictures! Oh I am all for quick and easy. This looks so good. Missed many of your posts, TBC. I can do the same with some pasta, right? You know what we get lot of these here in Moscow.I normally steam it....going to try your style also. Kalai, Cynthia, Sandhya, EC, Uma, D & C, Madhu, Sia, Sunita, Pooja, Happy Cook, Musical, Vanamala, EMWK, Vaishali, Rama, Vegeyum- thank you so much for stopping by and for leaving your sweet comments. Sra- it is probably is available in some of the fancier stores. I'd never even heard of this till I got here! Seena- yes. Do try it- it makes for a really quick and tasty meal. Laavanya- I do that with so many things. Try Patricia's fudge. It is just great. How is the business coming along? I never heard of these. Looks nice. I'm learning something new all the time. TBC, I have an award for you on my blog. Do take a look! was blog surfing and stumbled upon u r blog... wow, interesting recipe.. But i dont think we get pierogi in our country.. could u tell me wat it is made of? so i can try it at home.. I have only heard of these on MIB, but they look fantastic! I am so happy I found your blog. Jessica and Nathan- welcome and thanks for stopping by! :-) BTW, what is MIB? the photo is so appealing.. nice customisation of a snack!! 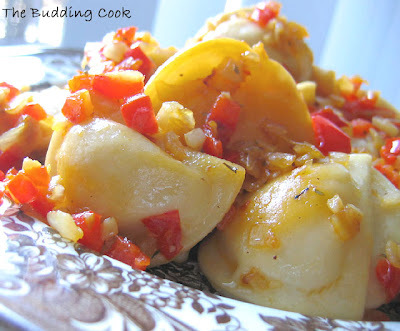 I really like perogies but never made them. Looks great.